BT has today announced that 31,000 of their employees have officially been transferred (TUPE process) to become part of an “independent workforce” under Openreach, which is a key part of Ofcom’s requirement that the network operator become a “legally separate” company (a wholly owned subsidiary of BT plc). On top of that it’s also been announced that BT’s Northern Ireland Networks engineering division is to be rebranded ‘OpenreachNorthern Ireland‘. The Northern Ireland Networks team will thus report into Openreach, albeit retaining their local management team and organisational structure. Both developments stem from Ofcom’s 2016 Strategic Review, which ruled that Openreach still had an “incentive to make decisions in the interests of BT, rather than BT’s competitors, which can lead to competition problems” and that they had failed to “sufficiently” consult rival ISPs (i.e. those using their network) on future “investment plans that affect them.” They were also deemed to have under-invested in their network. In response BT and Ofcom reached a voluntary agreement, which aimed to boost competition by giving rivals easier access to the operator’s infrastructure and fostering an independent governance structure for Openreach, as well as tougher minimum service quality standards, separate branding, new consumer protection measures and better information sharing etc. Back in June 2018 the regulator reported that Openreach was making “satisfactory” progress with their efforts to become a distinct company away from BT. However they also called for “bolder” commitments for the rollout of FTTP based “ultrafast broadband” connectivity and highlighted problems with implementing the aforementioned TUPE transfer of employees, as well as some changes in N.Ireland. But progress has been made. “This is an important day for Openreach as we’re fulfilling the commitments to Ofcom under the Digital Communications Review. Openreach now has its own Board, greater strategic and operational independence, a separate brand and an independent workforce – and we’re ambitious for the future. 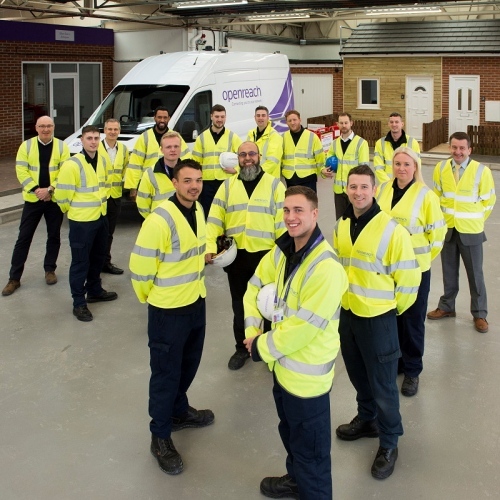 We’ve set out a clear plan to invest in new, more reliable, future-proof broadband technology, and we’re right in the middle of our largest ever recruitment drive for 3,500 engineers – so it’s an exciting time to be part of Openreach Limited. As it stands Openreach intends to make their Gigabit capable FTTP broadband network available to 3 million UK premises by the end of 2020 and they have an ambition to reach 10 million by around 2025, although we’re still waiting for that ambition to be confirmed as a reality (all the signs say it will be but negotiation is on-going). The legally separate operator can now boast of having the “largest team of fibre broadband engineers in the country,” although strictly speaking they had that before today too. Meanwhile they’re aiming to boost the uptake of their fibre based services via new discounts, which could free up more public reinvestment under the Broadband Delivery UK programme in order to help further improve superfast broadband coverage. As of March 2018, BT has made provision for £528m to be returned over the lifetime of the BDUK contracts (stems from clawback in the contracts and related high take-up) and £80m of this has already been committed – earlier than required (many contracts run for 7 years) – to improve speeds and coverage in certain areas. As a result of today’s update Ofcom has said they are “now in a position to implement our July 2017 decision to release BT from the 2005 Undertakings … We will provide a further update on 31 October 2018 when we intend to issue the formal notice of release of the 2005 Undertakings.” This is essentially the formal process of swapping them from the old model of regulatory framework and moving them to the new one.